"Indrajal Comics" started as a comic devoted to "The Phantom", but from issue 33 the series started to alternated between various characters like: "Mandrake the Magician", "Flash Gordon", "Rip Kirby", "Phil Corrigan", "Buz Sawyer", "Mike Nomad", "Kerry Drake", "Garth" and "Bahadur" by Aabid Surti. A total of 803 issues of Indrajal Comics were published, ceasing in April of 1990. Issues 123 and 124 were never published due to an industrial strike. The Indrajal Comics contain colorized versions of Mandrake stories, edited with expanded, reduced or omitted panels, to fit the format of the comic book. The stories in the first issues was King Comics stories and later daily and Sunday stories. In 1983 the numbering changed from the ongoing numbering to year and issue. So issue 444 became Vol. 20 #1. At least 2 Synopsis of Indrajal Comics" stories was issued to the subscribers of Indrajal Comics. There also exist an album with 12 stories of Indrajal Comics in one volume. 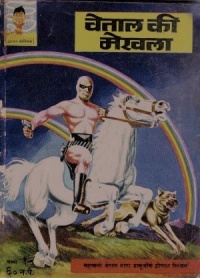 Indrajal Comics was available in several language editions, beginning in 1964 with an English, a Hindi and a Marathi editions. In January 1965 a Gujarati and a Tamil edition came, and a Bengali edition in 1966. 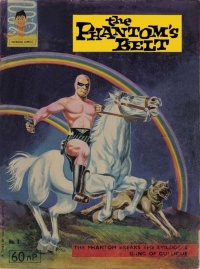 Then an Arabic version in 1977 (only issues with "The Phantom"), a Kannada from issue 349 (1980), a Malayalam version from issue 381 (1981) and then a Telugu version. The different language versiones were sometimes released with a different periodicity than the main editions. Issues with covers in English can be viewed here. Issues with covers in Hindi can be viewed here. Issues with covers in Bengali can be viewed here.